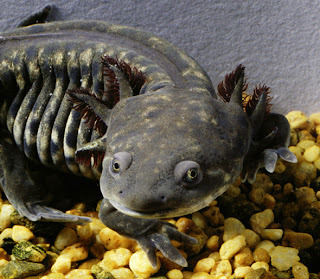 Do you remember the Axolotl? 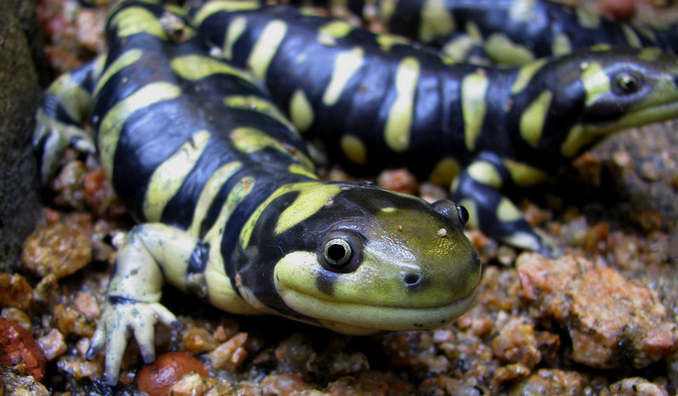 Well check out their close relative, the Eastern Tiger Salamander! Doesn't he look grown up? Adult Tiger Salamanders are completely land living. They have a wide range across the eastern half of North America, but you might not see them because they spend their time in underground burrows they dig for themselves. They are a kind of Mole Salamander, after all! 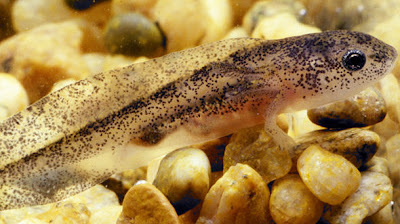 Baby Tiger Salamanders are aquatic and have gills and a tail fin to let them do all the stuff they have to do. Eat, basically. They get bigger and bigger. And they look just like an Axolotl! 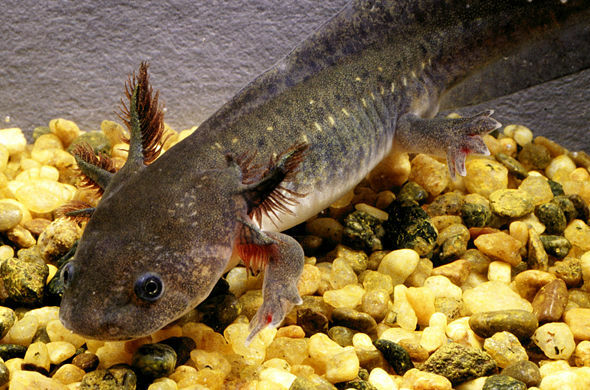 It's just that the Axolotl looks like that for all its life, while the Tiger Salamander will eventually metamorphose into an adult. In can take months or years for them to reach adulthood, depending on temperature and the like. Some will metamorphose as soon as possible, making small, terrestrial adults in cold areas or where water bodies dry up every season. Tiger Salamanders in warmer areas do their growth as larvae and will transition into adulthood when they reach around 20 cm (8 in) long. There are even some populations of Tiger Salamander that don't metamorphose at all, just like the Axolotl! They tend to get even bigger than a normal adult. Amphibians just don't have the kind of rules we do. I'm fairly sure there's a population that grows some kind of hair, too. No wonder the Axolotl doesn't want to grow up, when these "tiger" salamander adults look like frogs! Haha! 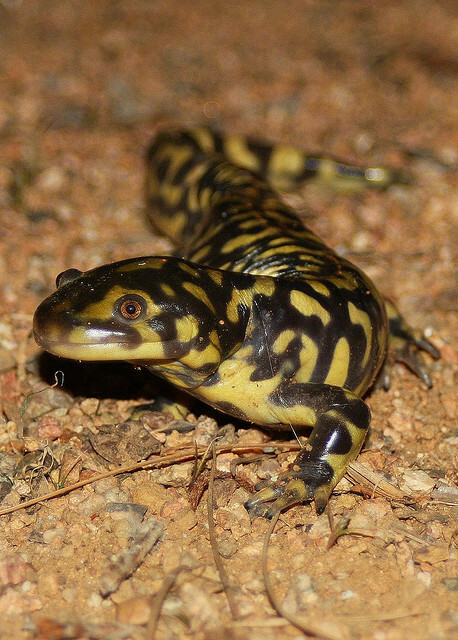 So it's a tiger that's a kind of mole that's a kind of salamander that looks like a frog. 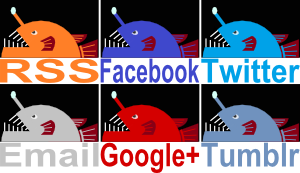 Maybe the Axolotl is confused from these mixed messages? LOL!!! glad i had already finished my coffee this morning or i might have spewed it! Haha! I'm glad you escaped it, I don't think either the salamander or I would want to be responsible for that! 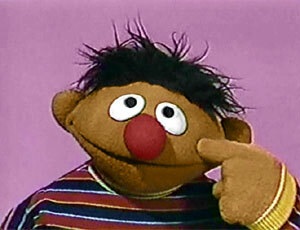 Neither did I, but as I saw that salamander I just couldn't get Ernie out of my head!